There are many methods and approaches to baiting that we can use to catch carp. In this section, we will address baiting tightly to a feature to pick up a specific fish. If you are lucky enough to spend some time watching the water you may be able to establish regular patrol routes of the Carp. This is an ideal situation if you are targeting a specific fish (in a smaller water) for capture. You can then set up a tightly baited spot around the fish’s movements within the local ‘patrol route’ thus increasing your chances of capturing the fish that you have targeted. A PVA bag or a few crushed boilies around a single bait are ideal in this situation. If on the other hand, you are fishing a new or unknown water there are a number of things that you can do to increase your chances of capturing some of the residents in a relatively short amount of time. First off there’s the obvious signs of fish crashing that will give themselves away above the water. A single hook-bait or PVA bag right to the area should do the trick in many cases. If you have arrived at a new lake and like the look of a particular swim, because of maybe the direction of the wind (The North-Eastern corner of a lake will get the warm South Westerly wind) or some features above the water that you think may attract the fish (Overhanging trees, Lillie pads and reeds etc.) the next step would be to find a feature on the lakebed to fish to. After getting the marker rod out and getting a picture of what is in front of you (You may want to draw a diagram like the one below so that next time you fish the swim you have a reference of what is there) you will want to find a feature that you feel might be a natural place for the carp to visit (a patrol route feature) because of the possibilities of it finding natural food in the area. Gravel bars and ‘clear spots’ are an example that many anglers fish. The troughs between gravel bars will be haven for a great deal of natural food. Also, a clear patch of gravel or lake-bed may denote a regular feeding spot for the carp that have ‘cleaned’ the area through feeding. This can be something as simple as a worm bed on a clay bottomed lake, a clear spot in dense weed growth near gravel spots or an area where food naturally accumulates due to the structure surrounding the lake etc. An excellent method of approach to baiting to a relatively small feature is taking a handful of boilies (or whatever your bait of choice) and then tightly baiting to the area with your hook-bait just off to the side. This can be done with a PVA bag presentation, stringer or loosely if you have a good eye with a catapult. This approach does take some discipline as it is very easy after an 8-hour period to second guess your bait positioning and either pull in and recast or continue to add bait to the area (We’ve all done it!) when you know that if the fish had passed through you would have gotten the run. You must be very confident in your bait presentation in these cases as there is little room for error. For example, the fish in the photos above was caught at 60 yards in a clear piece of gravel that was roughly two feet square that immediately sloped to surrounding rotting debris and tree branches that would likely cause a problem with your hook-link on the cast though would also be a good natural food holding spot. 20 boilies were placed right on top of the gravel spot and the hook-bait was placed right on the edge of the ‘slope’ of the gravel spot. It took roughly 12 hours for the one run Sean received, but it was well worth it! In this next example of Feature Baiting, we were lucky enough to be able to take photos, make drawings and measure off distances to the features on the lake bed we were interested in during a very rare draw down several years back. This proved invaluable in locating the exact area(s) to place our baits. We'd observed Big fish feeding and 'crashing’ in that area many times at full water but attempts to catch them had been nearly impossible due to severe snags that we kept losing good fish to. We'd also lost many marker floats on trying to locate a 'safe' area to fish here. So, the draw down was a real boon (pardon the pun...) for us on this swim. Click the image to the left to enlarge. On the right-hand side of the photo, look to the area above the rock scree, under the tree. There you'll see a full-sized family picnic table big enough to seat 8 people. This will give you some size reference on this photo taken with a telephoto lens from the other side of the lake. 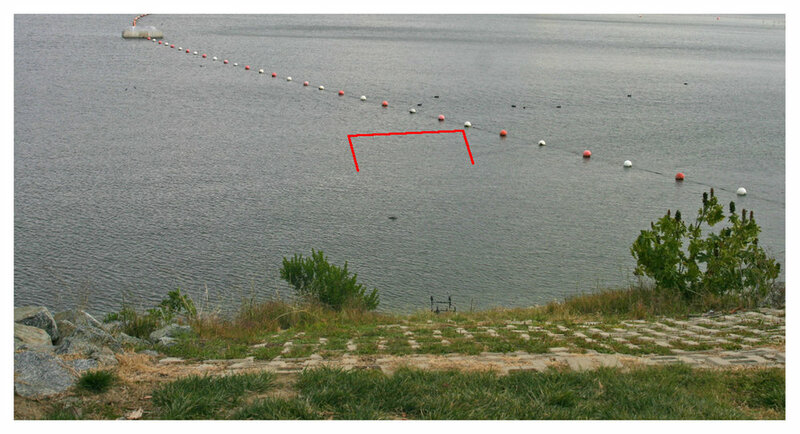 The area denoted by the red box is shown in detail in the photos that follow below this one. In addition to shooting the photos and video, we also made meticulous drawings of the lake's terrain and measured out each spot from a predetermined mark on the shore from where it was both safe & easy to cast from. The photo to the right shows the area just in front of the big rock pile pictured above. This was the hottest spot on which to place a bait in this swim. The other numbered spots showed where the fish regularly fed in the following years of water at the full level mark. We found that fishing tight to one of these numbered areas (especially marks 1 through 6 closest to the rocks and drop-off) tightly baited produced a higher percentage of the big fish. While "Area baiting" brought in many 'teen' sized fish to contend with. There is about 20' or about 6 meters between mark #9 and #2, this consistently made all the difference to both size of fish caught and over-all quantity. During the low water level period, it was a relatively simple process of measuring off the distance, clipping up the line at that length and casting to mark on the opposite bank to get to the bait on exactly the right place. We had to fish locked up (reel clutch pretty much tightened right down) and obviously, with the reels in this condition, we had to stay tight to our rods always or risk losing the rod and reel. If a fish could run or get up a "head of steam" towards the rock pile, it would almost certainly end up being lost as the Carp always instinctively knew to weave a path to deep water through the rocks to safety. Many good fish have come from this swim over the last few years using the information we collected. Here are Evan Bull and American Carp Society Founder, Wayne Boon with two great specimens caught from the same mark in this swim.